2. Chop the carrots, onion, and the garlic into small pieces and slice the mushrooms. 3. Cut the pork lengthwise – but don’t cut completely through. 4. Season the inside of the pork with salt, pepper, paprika and rub with red pesto. 5. 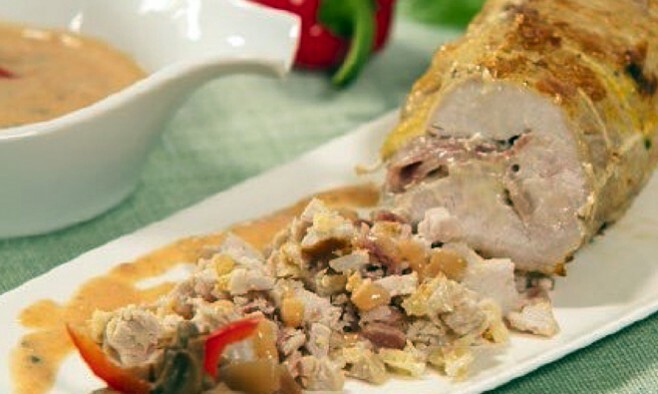 Place the slices of ham on top of the pork and layer with grated cheese. 6. Roll the roast tightly, press firmly and tie with twine. 1. Place the meat in a greased roasting tin and roast in the preheated oven for 40 minutes – regularly basting with the juices. 2. Meanwhile, fry the chopped onions, carrots and garlic in a pan, without browning. Add the mushrooms and sprinkle with lemon juice. 3. Stew the vegetables until al-dente. 4. Deglaze with the white wine and reduce until most of the liquid has evaporated. 1. Take the dish out of the oven, remove the roasting fat and carve into thick slices. 2. Place the slices back into the roasting tin and pour the brown cream sauce over the stewed vegetables. 3. Put the complete dish back into the oven and roast at 120 °C for a final five minutes. Level 6: cut a portion of the roast into smaller pieces. Level 5: grind separately a portion of the roast and trimmings. Level 4: mix separately a portion of the roast with the sauce until the required consistency. Level 3: mix and sieve separately a portion of the roast with sauce until the required consistency.